SmartCoach™ can be used for performance monitoring of any weight stack machine, free weights, flywheels and VersaPulley™ devices. The "standard" SmartCoach™ system is the most known product, and is the best compromise between functionality, versatility and cost effectiveness. 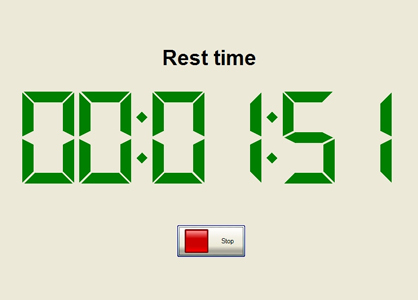 It is composed by a SmartCoach Power Encoder and software. The Power Encoder is a small (10 x 10 cm) device that can be used with any weight stack machine, free weights, or flywheel training device. It is connected to the computer trough an USB cable which also provides power, making it completely portable for field use. For use with weights, its nylon wire is hooked to the weight stack, barbell or dumbbell and measures the lifting speed during exercise. When used with isoinertial devices (kBox, VersaPulley™, etc), a special sensor mounted on these machines measures the rotational speed and feeds it into a dedicated input of the Power Encoder. The data collected from the Power Encoder is fed into the computer and used in the software to compute all the training variables: force, speed, power, work and so on. 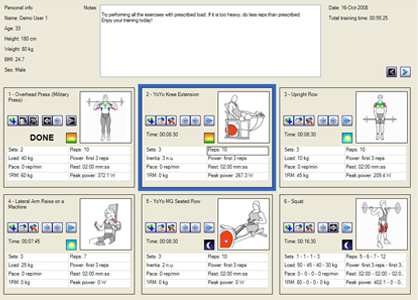 The SmartCoach™ software has a powerful editor which allows creating and printing training schedules from a library of more than 100 exercises. 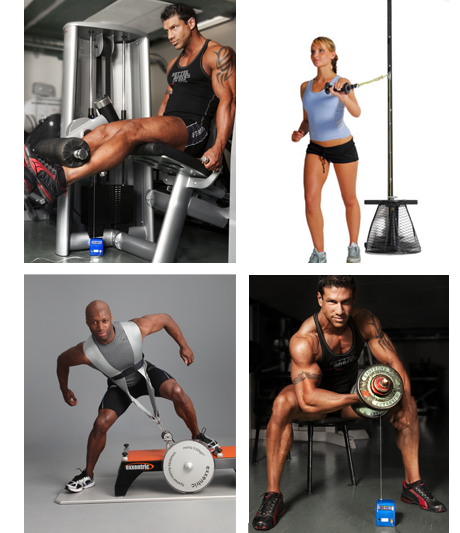 But it is also possible to define your own drills with user-defined name and icon, and even aerobic or core exercises. 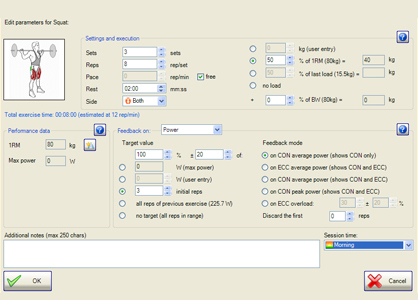 All the exercise parameters are configurable: the number of sets, reps, load, and optional target power or speed. Advanced configurations with increasing or decreasing load and/or reps (pyramidal workout) are also possible. The training load can be expressed in kilos, as a percentage of maximal load (1RM) or as a fraction of the body weight (BW). A new feature allows choosing the load and target power directly on the athletes power-load curve from the most recent power test. The embedded calendar allows planning the schedule for day or an entire, week, month or season. It is possible to copy and paste sequences of exercises into different days or to different athletes; it's even possible to propagate an entire training period from one to an entire team or group, managing the schedule of an entire team in few seconds. During exercise, an intuitive feedback shows the power or speed developed. For each rep, the colour of the bar and a voice feedback indicate if the parameter falls into the prescribed range, or if it's below or above. The feedback can be used to control and display the concentric or eccentric phase, or both. The target power can be relative to the athlete's max power estimated from a power test, a percentage of last day's average (e.g. 102% to spur an increase of 2%), or other combinations. The tolerance range is also adjustable, e.g. to train the athlete's or patient capability of finely controlling the execution. A specific feedback mode on eccentric overload is available for isoinertial exercises (on flywheel machines, e.g. and VersaPulley™ and kBox); it allows controlling the degree of overload attained, exploiting the unique features of these machines in controlled conditions. An unique option even allows defining a variable-feedback profile, i.e. a variable target power for each repetition following an user-defined pattern. 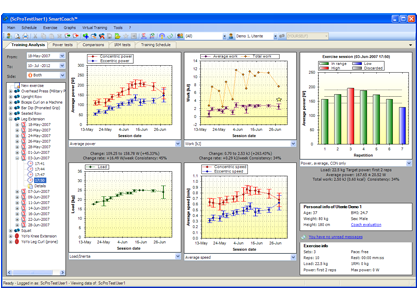 The powerful analysis tools allow immediate assessment of training progress. Intuitive graphs show the improvement of both concentric and eccentric values of power and speed, work per set and per session, load, pace and range of motion, and even propulsive and braking phase. The trend graphs give an indication of the overall change over days, as well as intra-day variability (consistency in execution). 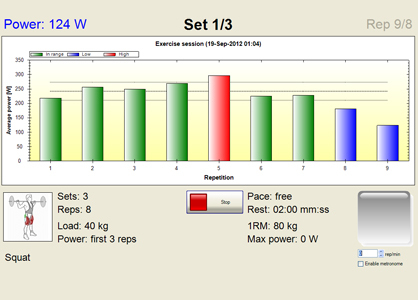 Of course it is possible to analyze in detail each single set, discard undesired reps, export data to Excel, and more. It is also possible to filter the training sessions per day, side and even load range - for example, by plotting only the sessions with loads between 70% and 100% of 1RM, to restrict the analysis to hypertrophy sessions only. Or, restrict the analysis to a defined period (e.g. the last physiotherapy session or last game season). Power tests estimate the curves of power versus load and speed, allowing the assessment of the optimal training load with objective criteria. A novel wizard function uses the power-load curve to automatically estimate the training load given the desired power (e.g. 70% of max power) and the region of the power curve where to work (high load and low speed, or vice versa). It is possible to compare the curves from different power tests (pre versus post, left versus right limb, dates A, B and C, etc.) and estimate the relative change in max power, optimal load and speed. 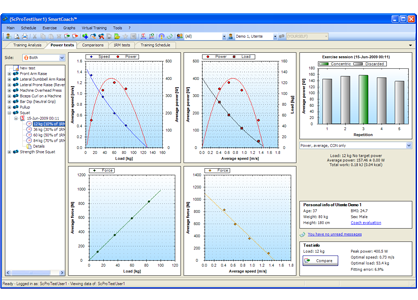 Finally, an imbalance assessment tool allows evaluation of left/right asymmetries both in test and training sessions.